Current Exhibitions: New exhibitions now open! We opened some brand new exhibitions Thursday, November 20! Organized by the Galerie Colline in partnership with the Centre des arts de la Petite église d’Edmundston and in collaboration with the Beaverbrook Art Gallery with the support of the World Acadian Congress Committee and the Sheila Hugh Mackay Foundation. Presented at the Beaverbrook Art Gallery with the support of CI Institutional Asset Management (CI Investments). Organized by the Beaverbrook Art Gallery and the UNB Art Centre with the support of the friends and family of Lucy Jarvis. Organized by the Beaverbrook Art Gallery and made possible by Earl & Sandy Brewer. As well as a memorial display of works by the late Fred Ross. Organized by the Beaverbrook Art Gallery with the support of the Province of New Brunswick and the City of Fredericton. John Leroux, curator of the exhibition Modern in Nature: Bruno Bobak’s Vancouver Years (1947 – 1960), will speak on December 4th at 7 pm. Experience and create art, play, meet local artists, make new friends and discover new things about yourself. Our Wednesday afterschool art program nurtures creativity, self-expression and confidence. Gallery visits, occasional outings, music sessions, snacks and art materials included. $80 per month per child, monthly registration only. This is a licensed afterschool program. Thursday Night Art Classes through November and December will be taught by Sandy Brewer. Sandy Brewer will be teaching watercolour, acrylic, and mixed media inspired by the art of Lucy Jarvis and Bruno Bobak. Expositions Courantes : Des nouvelles expositions sont maintenant ouvertes! Les expositions de notre saison d’automne sont ouvertes depuis le jeudi, 20 novembre. Présentée à la Galerie d’art Beaverbrook avec le soutien du Programme de Gestion d’Actifs Institutionnels CI (Placements CI). Organisée par la Galerie d’art Beaverbrook et le Centre des arts de la UNB avec le soutien des amis et de la famille de Lucy Jarvis. Organisée par la Galerie d’art Beaverbrook et rendue possible grâce à Earl et à Sandy Brewer. avec le soutien du gouvernement du Nouveau Brunswick et de la ville de Fredericton (Programme de subvention aux arts, à la culture et au patrimoine). Faîtes l’expérience et la création de l’art; jouez; rencontrez des artistes; rencontrez des nouveaux amis et découvrez de nouvelles choses à propos de soi-même. Notre programme parascolaire des mercredi après-midis encouragent la créativité, l’expression de soi, et la confiance. Des visites de galerie, des sorties à l’occasion, des sessions musicales, des goûters, et tous les matériaux d’art sont inclus. 80 $ le mois; enregistrement mensuel seulement. Ce programme est un programme parascolaire agréé. Ce programme est offert uniquement en anglais. Les cours d’art des jeudis soirs : En novembre et décembre, les cours d’art seront enseignés par Sandy Brewer. Sandy enseignera l’aquarelle, l’acrylique, et les techniques mixtes en prenant l’inspiration des oeuvres de Lucy Jarvis et Bruno Bobak. Frais : Aucun coût pour les petits; l’adulte qui accompagne l’enfant paie les frais réguliers d’entrée. GRATUIT pour les membres. Ce programme est offert uniquement en anglais. Une partie de la Série apprendre et créer C. Elizabeth Baker. The Thursday Night Art Class for tomorrow, November 27, 2014, has been cancelled due to anticipated poor weather. Classes are scheduled to resume December 4. Le cours d’art des jeudis soir de demain, le 27 novembre, est annulé par raison de mauvais temps anticipé. Les cours sont prévues de reprendre le 4 décembre. Changement de date: la conférence de John Leroux au sujet de l’exposition De Nature Moderne : Bruno Bobak À Vancouver (1947-1960) aura maintenant lieu le 4 décembre, pour raison de mauvais temps (http://beaverbrookartgallery.org/fr/apprenez/conferences-et-presentations). John Leroux, curator of the exhibition Modern in Nature: Bruno Bobak’s Vancouver Years (1947 – 1960), will speak on November 27th at 7 pm. Get a head start on your shopping with the Gallery shop’s holiday preview sale! From Nov 14th – Nov 23rd, select merchandise in the Gallery Shop will be discounted an additional 15%—that’s 15% for non-members, 25% off for Members and 30% for Life Members! Also, save up to 50% on select exhibition catalogues and books. Spend $50.00, or more and receive a set of seasonal notecards from the BAG at half price! Changement de date: la conférence de John Leroux au sujet de l’exposition De Nature Moderne : Bruno Bobak À Vancouver (1947-1960) aura maintenant lieu le 4 décembre à 19 h 00, pour raison de mauvais temps (http://beaverbrookartgallery.org/fr/apprenez/conferences-et-presentations). Partez du bon pied pour vos achats des fêtes avec la vente-aperçu de la boutique! Du 14 au 23 novembre, prenez une réduction supplémentaire de 15 pourcent sur une sélection de marchandise dans la boutique—c’est-à-dire 15 pourcent pour les non-membres, 25 pourcent pour les membres, et 30 pourcent pour les membres à vie! En plus, prenez une réduction de 50 pourcent sur une sélection de livres d’exposition et autres. Dépensez $50 ou plus, et vous pouvez recevoir une sélection de cartes de la Galerie d’art Beaverbrook à moitié prix! Plus d’informations (y inclus les petits caractères obligatoires) sur cette page, à la boutique ou par courriel à shop@beaverbrookartgallery.org. Current Exhibitions: New exhibitions open the 20th, others already open! We opened some brand new exhibitions Sunday, October 5! We’re opening new exhibitions Thursday, November 20th! 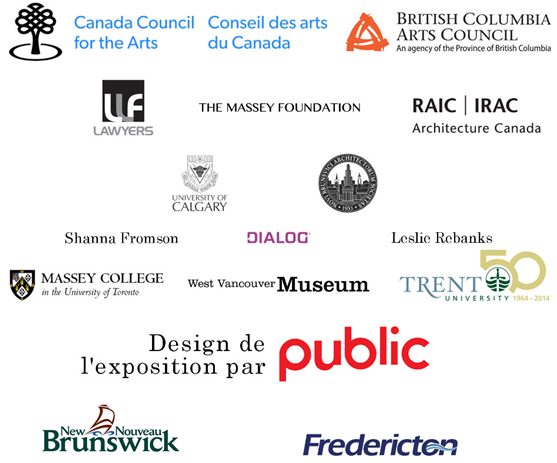 Join us on November 20, 2014 at 5:00 PM to celebrate our new exhibitions! More information can be found here. $80 per month per child, monthly registration only. This is a licensed afterschool program. Expositions Courantes : Des expositions seront vernies le 20 novembre, d’autres entre-elles sont déjà ouvertes! Les expositions de notre saison d’automne sont ouvertes depuis le dimanche, 5 octobre. Vernissage d’expositions: Soyes des nôtres! Soyes des nôtres le jeudi, 20 novembre à 17 h pour célébrer le début de nos nouvelles expositions! Plus de détails se trouvent içi. This month, colleagues and friends will be reunited at the Beaverbrook Art Gallery. | Ce mois-ci, deux collègues, deux amis seront réunis à la Galerie d’art Beaverbrook. This month, colleagues and friends will be reunited at the Beaverbrook Art Gallery. Fredericton, NB, November 10, 2014 – New exhibitions open November 20, launching the second part of the Beaverbrook Art Gallery’s fall season. The public is cordially invited to attend the opening reception at the Beaverbrook Art Gallery, Thursday, November 20, 2014 at 5 pm. Two creative forces are highlighted in these new exhibitions: artist Bruno Bobak and architect Ron Thom. Colleagues and friends, both transcended a single-genre focus and branched out into many other media, from painting to printmaking to pottery to design. Both were driving forces in Vancouver’s cultural movement of the time, and concerned with the organic and the natural in response to the industrial direction of the post-war world. In 1947, Bruno and Molly Bobak made their way West after the war for a fresh start and to build their careers. As an artist and an educator at the Vancouver School of Art, Bruno Bobak found himself embedded in western Canada’s emergent art and de sign movement. Modern in Nature: Bruno Bobak’s Vancouver Years (1947-1960) explores that period in Bobak’s career and artistic development. “The 1950s were incredibly fertile years for Bruno Bobak,” writes curator John Leroux. “Not shackled by being labeled a painter and printmaker, he also explored many other artistic mediums such as fine craft, jewellery, pottery and architecture; and succeeded magnificently at all of them. Whatever he pursued, he fused artistic rigour with a vivid sense of material integrity, rich colour, and oftentimes a sense of whimsy for good measure.” This period saw Bobak’s recognition and career take off, his work being featured in exhibitions internationally and collected by the National Gallery. According to Beaverbook Art Gallery Director/CEO and Chief Curator Terry Graff, the spark for this exhibition came from a donation of works from Bobak’s estate following his death in 2012, “many of which reveal a lesser known, but important dimension of Bobak’s story. Among these works are outstanding examples of an especially prolific period in his career when he and his wife, artist Molly Lamb Bobak, were fully ensconced in Vancouver’s vibrant art and design community.” The Vancouver focus of this exhibition provided a natural bridge to a fortuitously-timed exhibition centring on Ron Thom. An architect, Ron Thom worked in a different field but nevertheless from a similar ethos as Bobak. Thom saw architecture as an art form itself, and as connected to all other arts, and shied away from industrial influences: “instead of adopting the stark modernism of the International Style,” says Adele Weder, curator of the exhibition, “Thom drew on his love of nature and art to create organic, warm and intimate places. Like Frank Lloyd Wright, Thom believed in creating not just a building for a client, but a gesamkunstwerk, or a total work of art, from the landscaping to the interiors and the furniture to the ceramics. It was an ethos that inspired Thom to shape his architecture with poetic drama.” His design work became a key part of the Canadian architectural identity. Ron Thom and the Allied Arts presents work from a key period in Thom’s career, from 1947 to 1972, centering on his key masterpieces—the west coast houses, Massey College, and Trent University—and the allied arts that informed their design. The exhibition presents a variety of components, from sketches and drawings to paintings to furniture and craft designed or commissioned by Thom, providing an overview of this Canadian architectural icon’s work and vision. These two exhibitions will join three already in progress: Lucy Jarvis: Even Stones Have Life; Studio Watch: Emerging Artist Series: Painting: Andrea Brewer; and Imagined Dialogues; all running through January 11, 2015. Modern in Nature: Bruno Bobak’s Vancouver Years (1947-1960) and Ron Thom and the Allied Arts will continue through March 1, 2015. 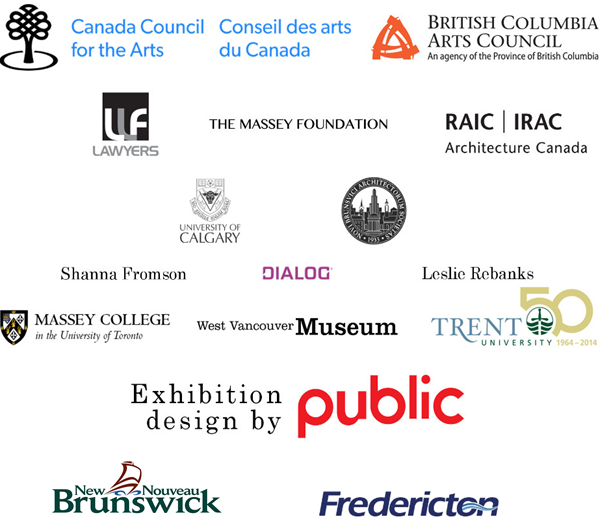 They are supported by our funders, including the Province of New Brunswick and the City of Fredericton, among others. Ce mois-ci, deux collègues, deux amis seront réunis à la Galerie d’art Beaverbrook. Fredericton, N. B., le 10 novembre, 2014 – Pour le lancement de la deuxième partie de sa saison d’automne, la Galerie d’art Beaverbrook lance de nouvelles expositions le 20 novembre. Le public est cordialement invité à assister au vernissage à la Galerie d’art Beaverbrook, le jeudi 20 novembre 2014 à 17 h. Ces expositions présentent deux forces créatrices : l’artiste Bruno Bobak et l’architecte Ron Thom. Collègues et amis, tous deux ont transcendé la concentration sur une seule discipline et se sont lancés dans bien d’autres médiums, de la peinture à l’estampe et de la poterie et jusqu’au design. Ils étaient tous deux des forces motrices du mouvement culturel de l’époque à Vancouver. Ils partageaient aussi un intérêt pour tout ce qui est organique et naturel, en réponse à la direction industrielle que prenait le monde de l’après-guerre. En 1947, Bruno et Molly Bobak se sont rendus dans l’Ouest après la guerre pour recommencer à neuf et pour entamer leur carrière. Comme artiste et comme éducateur à l’École d’art de Vancouver, Bruno Bobak s’est trouvé au centre du mouvement émergent des arts et du design canadien. De nature moderne : Bruno Bobak à Vancouver (1947-1960) explore cette période dans l’histoire de l’art et de la carrière de Bobak. « Les années 1950 ont été incroyablement productives pour Bruno Bobak, affirme le conservateur John Leroux. Ne se laissant pas limiter par des titres comme peintre et graveur, il explore aussi bien des disciplines artistiques, tels les métiers d’art, la joaillerie, la poterie et l’architecture; disciplines dans lesquelles il connaît inévitablement du succès. Peu importe ce qu’il entreprend, il lie une rigueur artistique à un vif sens de l’intégrité matérielle, à de riches couleurs et souvent, pour bien faire, à une parcelle de folie. » C’est à cette époque que la carrière de Bobak prend son envol et que l’on commence à le célébrer; ses œuvres font partie d’expositions internationales et se retrouvent dans la collection du Musée des beaux-arts du Canada. Selon le directeur général et conservateur en chef de la Galerie d’art Beaverbrook, Terry Graff, l’inspiration pour cette exposition est née d’un don d’œuvres de la succession de Bobak, après sa mort en 2012. « Bon nombre de ces œuvres révèlent un côté moins connu, quoique bien important, de l’histoire de Bobak. Au nombre de ces œuvres, l’on compte des exemples impressionnants d’une période particulièrement productive de sa carrière, à l’époque où lui et son épouse, Molly Lamb Bobak, faisaient partie intégrante de la vivante communauté des arts et du design de Vancouver. » L’époque choisie pour cette exposition, les années de Vancouver, établissait un lien logique avec une exposition portant sur Ron Thom, placée au calendrier, par un heureux hasard, pour les mêmes dates. L’architecte Ron Thom travaillait dans un domaine différent, mais avec une philosophie semblable à celle de Bobak. Selon Thom, l’architecture est un art en soi, et elle est liée à toutes les autres disciplines artistiques. Il se distingue aussi de l’influence industrielle. « Plutôt que d’adopter le modernisme froid du style international, affirme Adele Weder, conservatrice de l’exposition, Thom s’inspirait de son amour pour la nature et pour l’art afin de créer des endroits intimes, organiques et chaleureux. Comme Frank Lloyd Wright, Thom croyait en une création qui ne servait pas qu’à satisfaire le client, mais à un gesamkunstwerk, une œuvre d’art complète, de l’aménagement paysager à l’espace intérieur et aux meubles jusqu’à la céramique. C’était cet éthos qui menait Thom à munir son architecture d’une intensité poétique. » Son œuvre en design devient partie intégrante de l’identité architecturale canadienne. Ron Thom et les arts connexes présente des œuvres d’une période clé de la carrière de Thom, de 1947 à 1972, avec un accent sur ses chefs d’œuvres les plus importants, les maisons de la côte ouest, le Collège Massey et l’Université Trent, et sur les arts connexes qui ont influencé leurs concepts. L’exposition présente des composantes variées, des croquis et dessins aux peintures, meubles et œuvres de métiers d’art conçues ou commandées par Thom, présentant un survol des œuvres et de la vision de cette figure de proue de l’architecture canadienne. Ces deux expositions s’ajoutent à trois autres qui sont déjà en montre : Lucy Jarvis : Même les pierres ont de la vie; Surveillance studio : Artistes de la relève : Peinture : Andrea Brewer; et Dialogues imaginés qui se poursuivent toutes jusqu’au 11 janvier 2015. De nature moderne : Bruno Bobak à Vancouver (1947-1960) et Ron Thom et les arts connexes seront en montre jusqu’au 1er mars 2015. Les expositions sont appuyées par donateurs, notamment le gouvernement du Nouveau Brunswick et la ville de Fredericton.